Philip II of Macedon's brilliant command lead to the rise of Macedonia after the Battle of Chaeronea. The city-states of ancient Greece were rich in culture and history. But following the Peloponnesian War, which lasted 27 years, they were exhausted, their best young men dead, Attica’s farms ruined. Not surprisingly, the city-states declined in political power and, indeed, in the level of their accomplishments. To a degree, they had fallen under the influence of Persia, which had supported the victorious Spartans against the Athenians. The Greeks, however, still valued their democracies, which allowed their citizens individual freedom. Moreover, they seemed to cling to their trait of avoiding even loose unions among the city-states to maximize their power. This they did despite the realization among at least some of their statesmen that only a united Greece could conquer Persia to retaliate for past indignities. Thus was the stage set for the rise of Macedon, mainly under the monarchy of Philip II, a fascinating story of the interplay between the semibarbaric Macedonians and the sophisticated Greeks. It is also an account of a Macedonian king who was a truly brilliant politician and strategist, although a hedonistic proponent of wine, women, and song. In the end, it was Philip, father of Alexander the Great, who fortified the power of Macedonia and united the Greek city-states enough to turn his attention to Persia and avenge the invasions of Darius and Xerxes. Not very much is known about the early Macedonians. They were partly barbarian and partly Greek, and when they first appear in history they were exceptionally disunited. The kingdom of Macedonia had its nucleus on a fertile plain, formed by three substantial rivers—the Haliacmon, Lydias, and Axius—that emptied into the Thermaic Gulf. The northern boundaries of the country were formed by a crescent of mountains, occupied by undeveloped and potentially aggressive tribal princedoms of mixed Illyrian, Thracian, and perhaps Greek origins. A number of tribes that were said to be of Grecian background dwelled on the plain. They were closely bound to the king, and the nobility, known as Companions (Hetairoi), were attached to the land and were bound to serve their prince or king on horseback, forming a primitive cavalry. The tribes in the hills generally looked upon the king of Macedonia as their overlord, but were frequently struggling for independence. When a weak king ruled, the story of Macedonia became that of petty warfare between these hill tribes, but strong kings were always trying to unite them into a nation. The kings of Macedonia called themselves Argeads because they traced their roots back to Argos and Heracles, thus claiming pure Greek descent. The Greeks of the city-states were often skeptical about these assertions, even though the court religion of Macedonia was Hellenic in character. The upper class spoke a language related to Greek or one of its branches, perhaps a primitive Aeolic dialect. The rest of the population, however, could lay little claim to Greek origins. 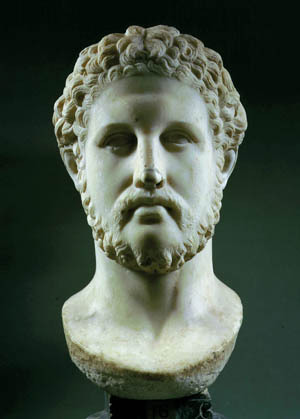 In 359 bc, Philip II became king of Macedonia. As a youth he had spent three years in Thebes, and it was there that he observed the Theban army. The military genius Epaminondas had developed the “oblique order of battle,” which at the time caused a revolution in military tactics. Hitherto the Greeks had usually fought in parallel lines, but the Thebans divided their front into offensive and defensive wings. The front wing was unusually deep and comprised the best troops. Its task was to advance in a concentrated attack and break through and defeat the enemy, while the weaker wing moved forward slowly and remained more on the defensive, so that at the moment of conflict the front of the battle line was in fact oblique to the enemy line. Both wings consisted of heavy infantry. 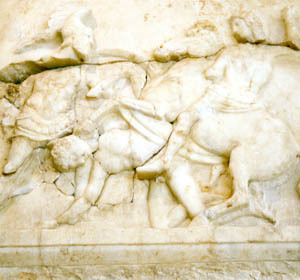 Epaminondas’s cavalry served only to protect the flanks. In parallel battle formations an offense was generally initiated by both combatants on the right wing; therefore, the Thebans’ advance utilizing the left had all the more element of surprise. Philip adopted and modified these tactics to fit the character of his Macedonian army. He assigned the offensive to his excellent cavalry, the Companions, and the defensive to his infantry phalanx. He did not confine the offensive to one wing, but sometimes launched his cavalry on the right and sometimes, as at the coming battle of Chaeronea, on the left, depending on topography and the nature of the hostile position. In spite of his military acumen, Philip’s situation was anything but promising at the beginning of his reign. He had no allies and no money; enemies surrounded him on all sides; and there was no unity in his kingdom. But he had youth, a few faithful friends, unbounded ambition, and a body fit to endure any hardships. He never asked anything of his soldiers that he was not ready to do himself, yet he inspired fear rather than affection in his men. The Macedonian monarch had three primary objectives: to create a standing army, to unite his nation into a real kingdom, and then to bring all of Greece under his rule. Having done that, he intended to march into Asia against the Persian king. The coastland of Macedonia at an early date had become the target for colonization by Greek city-states, which made profits from their exportation of Macedonian foodstuffs, metals, and ship-building timber at a time when the kingdom was not sufficiently advanced or organized to undertake this activity itself. In 357 bc Philip, after defeating the Illyrians who had killed his brother, captured the coastal colony of Amphipolis, to the alarm of the Athenians, who were concerned for their grain route. In the following year Philip seized Crenides (renamed Philippi), which enabled him to dominate the gold and silver mines in the proximity of Mount Pangaeum. The massive income from this source made it possible for him to overcome traditional Macedonian weaknesses. He was now in a position, for example, to engage in aggressive diplomacy, fueled by massive gifts and bribes. He was also able to transform his country’s pastoral economy into one of an agricultural nature. Above all, Philip personally organized the large-scale development of the Macedonian army, which became a professional national force, enlarged by the inclusion of non-Macedonians and displaying capabilities that had never been seen on the Balkan peninsula. The Macedonian infantrymen—small landowners or peasants—became soldiers who fought in a greatly improved infantry phalanx, carrying 13- to 16-foot pikes (sarissai) instead of the hoplite’s spear. This new phalanx was drawn up in a more mobile, flexible open order, and as outlined earlier, Philip’s infantry order of battle incorporated Epaminondas’s method of combining deeper and shallower contingents in the same line. The cavalry, which already possessed a heavy elite force of Companions (Hetairoi) as its nucleus, also became more formidable. It included special units whose principal task was to protect the flanks and rear of the infantry phalanx, in wedge formation. This well-timed coordination between the two arms (another technique learned from Epaminondas) was one of Philip’s specialties, as was a revolutionary development in siegecraft that encompassed the engineering innovations of Dionysius I , ruler of the city of Syracuse. Philip drank too much and behaved rowdily, but he was a more than competent commander, with the help of his best general, Parmenio. In addition, he showed great personal courage, sustaining wounds that caused him the loss of an eye, a broken shoulder, and a crippled arm and leg. Despite his handicaps, he was tireless and always more than ready to campaign during any season of the year. The outbreak of the Third Sacred War (356 bc) was caused by the seizure of the sacred community of Delphi by Phocian separatists, who opposed Theban control of their country. They used the temple treasure to recruit a new mercenary army. This prompted the Aleuadae of Larissa in Thessaly to appeal to Philip for assistance, thus offering him an opportunity to extend his influence southward from Thessaly into central Greece, where Delphi was located. After initial setbacks, he defeated and killed Onomarchus, the Phocian general, at the Battle of the Crocus Field (352 bc), despite help sent by Athens. But when a combined Greek army blocked Philip at Thermopylae, he turned northward, attacking Thrace, one of the largest and richest countries of the ancient world. He then conducted further operations in the area, thereby increasing his presence in the northern portion of Greece. At about this time, the Athenians introduced a policy of financial retrenchment, dictating that Athens’ military resources were to be concentrated on the defense of its essential interests, and not squandered on hazardous adventures. This raised the issue of how to deal with Philip. While the Athenians resisted him to some extent, they did not follow an aggressive foreign policy. The great orator Demosthenes appeared in Athens at about this time. As Philip increasingly made his presence felt around the Aegean, Demosthenes began to see him as a serious threat—to Athens in particular and to Greece in general. His impassioned speeches against the Macedonian king were entitled Philippics and they urged Athens, in conjunction with its allies, to aggressively oppose Macedonia. Philip did have designs on Greece, but he did not yet feel the time was ripe to put them into effect. Instead he extended his power in more northern lands, notably Epirus and Thessaly, and launched massive programs of road building, transplantation of inhabitants, and colonization. Meanwhile, Athens was frustrated in its operations around the Bosphorus, and in 340 bc, supported by a coalition that Demosthenes masterminded, declared war on Macedonia. The allies took a defensive stance, guarding a series of passes from Mount Parnassus to Lake Copais, thereby protecting Boeotia and Attica. Thus Philip was cut off from the Gulf of Corinth and his Peloponnesian allies. If Philip attacked and succeeded in forcing the passes, the allies could still fall back on the plain of Chaeronea and choose their battleground. Philip arranged for a letter addressed to his general, Antipater, to fall into the hands of Proxenus and Chares, the commanders of the allied forces stationed near Amphissa, stating that he had to depart to quell a revolt in Thrace. This caused the mercenary force guarding Amphissa to relax its guard. Suddenly, by a forced march, Philip, with a large body of troops, swept through the pass of Gravia by night, annihilated the defending force, and then descended upon Amphissa. By a vigorous move, he pushed on to Naupactus, at least two days’ march, returning to Amphissa before his enemies could take any action against him. He thereby opened a pathway to the Gulf of Corinth. Further, by occupying Amphissa and the surrounding territory, he had gained command of the passes leading through the outlying ranges of Mount Parnassus and Mount Korphis, which led into the plain of the Cephissus River to the south of Chaeronea. The allied generals at Parapotamii, finding their communications with Thebes and Athens threatened by Philip’s light troops, withdrew from the passes onto the plain of Chaeronea to gain an advantageous position. Philip then confronted the Greek army. The decisive battle took place on the 7th of Metageitnion (probably the 2nd of August, in our reckoning), 338 bc. The allies’ line stretched across the plain, their left wing resting against the rocky hill of Petrachos, on which the town was built, the right touching the Cephissus River, where it runs close beneath the steep, western end of the Acontium mountain spur. The total length of their front was a little over a mile. It included about 30,000 Boeotian, Athenian, and allied infantrymen. On the right were 12,000 Boeotian hoplites, including the famous Sacred Band on the extreme right flank. Interestingly, this elite Theban fighting force was made up of homosexual couples. Ten thousand Athenian troops stood on the left wing while allied hoplites and 5,000 mercenaries manned the center. The Macedonian force may have been slightly superior in number. Knowing that the Athenians lacked experience, Philip deliberately withdrew his right wing, which stood opposite them. He retreated step by step before the impetuous onset of the Athenians, who felt confident of victory. Stratocles, the Athenian general, even urged his men to pursue the enemy “to Macedonia itself.” At length, when Philip had retired about half a mile, and the Athenians had tired, he suddenly assumed the offensive. His plan was entirely successful; the Athenian line broke. The Macedonians then regrouped and took the Athenian force in the front and rear. Meanwhile, on the Macedonian left, the young Alexander, leading the Companion cavalry, succeeded in breaking through the Boeo- tian troops and further threatened the allied rear. Soon the allied position was hopeless. Some who were nearer the center were able to escape and make for the passes, but those on the extreme left, caught between the enemy and the rocks, could only surrender or perish. A thousand Athenians were killed and two thousand taken prisoner. All who could, fled in a headlong rout, among them Demosthenes. On the other wing, the Sacred Band was cut to pieces where they stood, and the general loss in the Theban ranks was very heavy. No serious pursuit was attempted by the Macedonians, mainly because they were too exhausted. The fugitives collected at Lebadeia. The Macedonian victory had been won with better training, masterly coordination between infantry and cavalry, and the superiority of the new pike-phalanx over the old spear-phalanx of the Greek hoplites. The Greek commanders were dominated by Philip, who had proven in previous engagements the effectiveness of a feigned retreat and of tiring the enemy before attacking them. 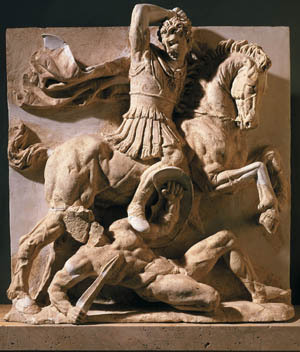 Although his troops were tired after the battle, it was still unusual from a military point of view for the Macedonians not to pursue the enemy after Chaeronea, allowing them to retreat southward. But Philip had other considerations. The time was ripe for him to introduce his long-designed reorganization of Greece, which involved reconciliation with the Athenians and their allies. Therefore, the renunciation of the pursuit and annihilation of the enemy was a gesture of his sincerity for an accommodation. The aftermath, however, was two-handed. Thebes paid dearly for joining Athens against Macedonia. It had to submit to the restoration of Plataea and Orchomenus, and to the reception of a Macedonian garrison in the Cadmeia. But Philip showed great leniency to the Athenians, returning their prisoners without ransom, and having Antipater and Alexander transport the ashes of their dead in solemn ceremony. He offered friendship and alliance with the assurance that Athens would remain free and independent. He demanded, however, that Athens dissolve its naval league and give up the Thracian Chersonese (Gallipoli Peninsula). Demosthenes had for years painted Philip as a great enemy whose sole aim was the destruction of Athens. Accordingly, the Athenians had prepared for a desperate resistance. Philip’s leniency so surprised them that they granted Attic citizenship to both Philip and his son Alexander and erected a statue of the former. Philip marched into Athens. He invited the Athenians to accede to the “universal peace” and to join the “League council” he intended to institute. Moreover, to win Greek sympathies, he carefully circulated the rumor that he wished to lead Greece in a Panhellenic campaign against Persia. When he moved with his army from Athens into the Peloponnese, he was welcomed by the towns devoted to his cause, and a separate peace was concluded with those that had formerly opposed him. Only Sparta refused to yield and had to submit to the devastation of Laconia by the Macedonians, Argives, and Messenians. Thus, Philip had become master of all Greece. Tags Alexander the Great, Battle of Chaeronea, Darius, Gallipoli, Macedonian, oblique order, Peloponnesian War, Persia, Philip II of Macedon, Xerxes.